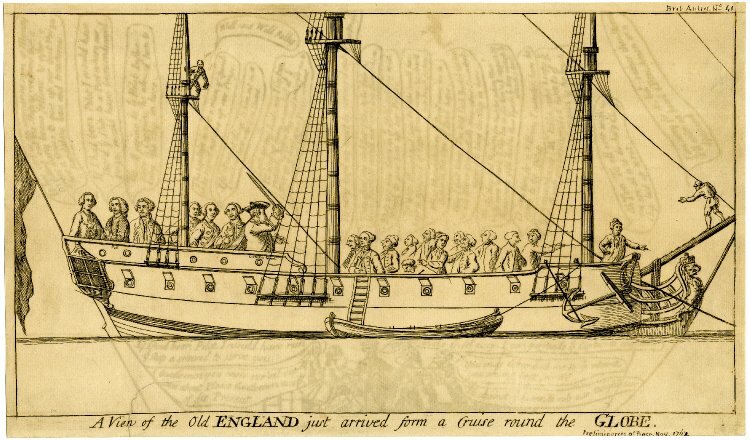 A View of the Old England just arrived form a Cruise round the Globe, artist unknown, c.1762, British Museum. The Seven Years War was a global conflict. Fought from the Philippines to Pennsylvania to India to Germany, it took Britain literally 'round the Globe.' In 1762, the war was drawing to a close with negotiations between Britain and France. These negotiations, coming at a time when Britain was racking up profound and very public victories, drew a wave of criticism. 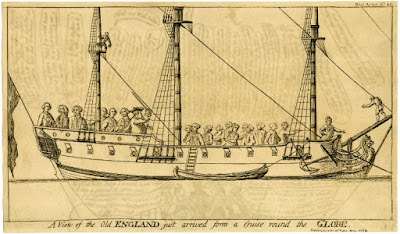 The unknown artist of this cartoon portrays "the Old England" as a trim fighting ship, carrying duplicitous ministers who mislead their king. Most of the figures are gentlemen in suits and wigs, but a few are common tarpawlins. 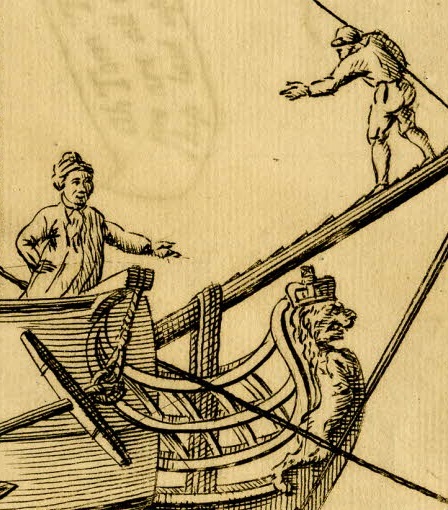 At the bow, one sailor steps down the bowsprit over a figurehead of a lion with a crown. As a side note, this is the dominant figurehead style of the time for Royal Navy frigates. The sailor stepping down wears a jacket tucked into his breeches and a jockey style barge cap. His mate gestures towards him, who wears a smock or jacket with slit cuffs, a neckcloth, and cap. 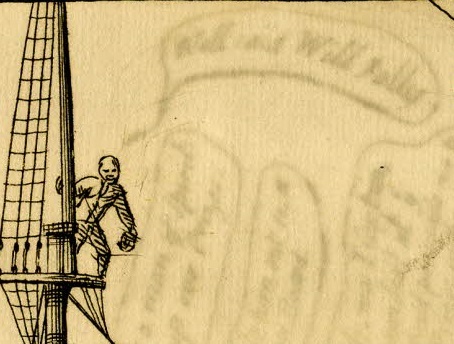 Aloft in the tops on the mizzen is a third sailor. Bald headed and wearing a single breasted jacket tucked into his breeches, he holds a hat or cap in his left hand.